The Microsoft Surface Go is a small form-factor laptop that has the build of a handheld tablet but runs on Windows. It features a 10-inch touchscreen with stylus functionality, a Pentium Gold processor, 4GB to 8GB of RAM, and starts at a price of RM1,955/SGD618 for the base model. When Microsoft told me they were sending over the budget version of their acclaimed Surface Pro, the Surface Go for review, I initially had a few reservations regarding having to play around with yet another small form-factor device. Usually working on a PC with a full complement of software, internal power, and at least a 15-inch screen or larger, my attitude towards doing work on tablet-sized devices was more along the lines of “I’ll do it only if I have no other option”. At the same time, I was also roughly aware that the Surface Go wasn’t supposed to be just another tablet device. I knew about it running on a more streamlined version of Windows, and heard plenty of good things about its supposedly strong productivity capabilities. So with those thoughts, I tried out the Surface Go for over a week to see whether it could complement my style of work. 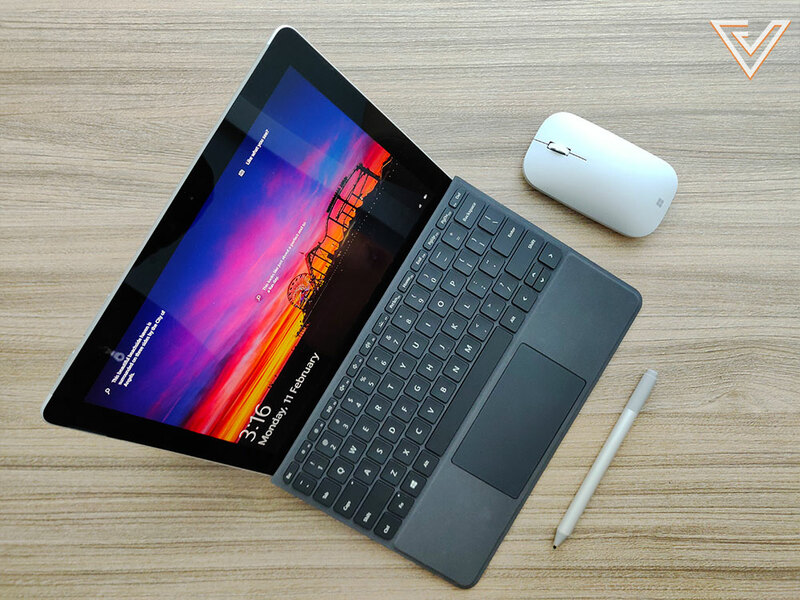 Size-wise, the Surface Go comes in at a very wieldy size of 9.65 inches by 6.9 inches and a weight of just half a kilogram, immediately making it one of the most portable Windows devices on the market. This all leads to it having a nice and sturdy feel when held by two hands, the curved edges rounding everything up nicely. I was more impressed however by the build quality of the Surface Go. The front 10-inch touch display sits tight and snug within its magnesium enclosure, and when you run your fingers around the device, you get the feeling that it’s a product meant to last you a good three to five years at least. Even its one moving part—the kickstand—feels very strong and sturdy when you deploy it, and you can rest assured that it most probably won’t break off from the main enclosure even if you’re a bit rough with it. 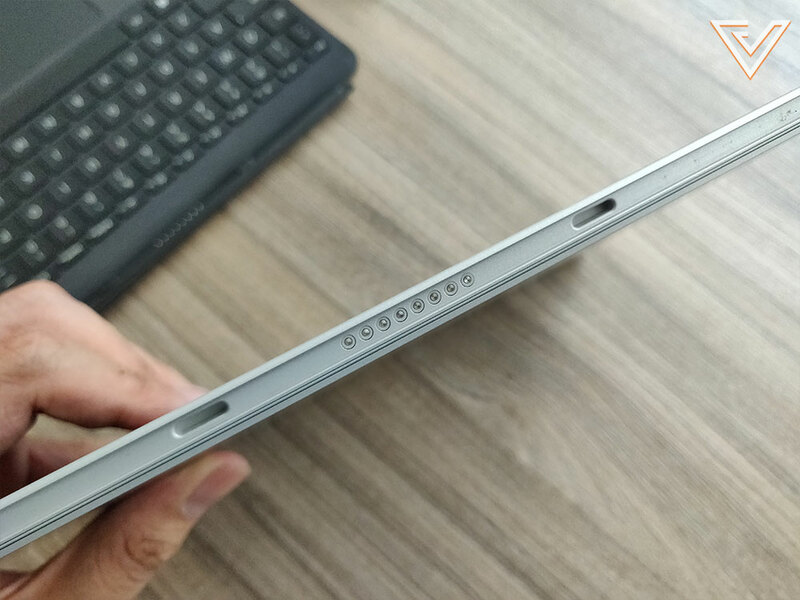 The Surface Go’s kickstand is strong and well-connected to its main body. 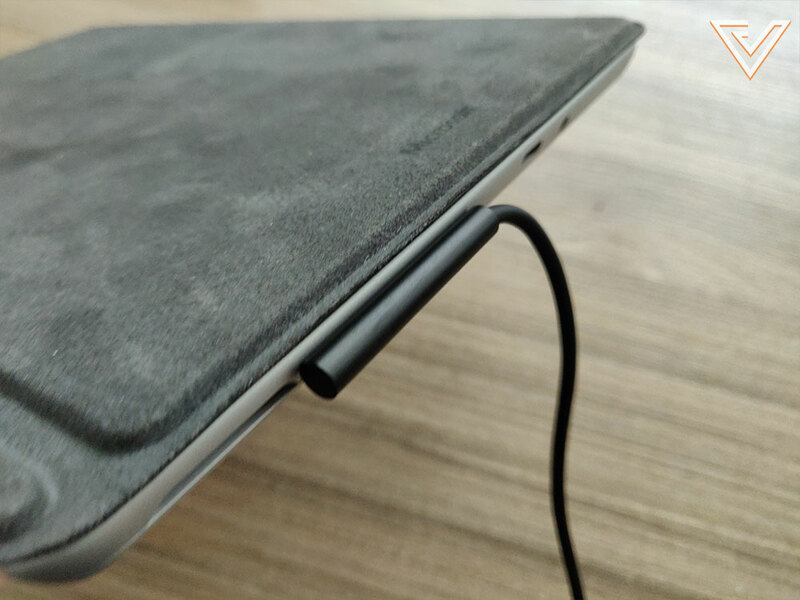 In terms of accessories, the Surface Go comes packaged with a proprietary charger that ends in a magnetic snap-on connector. This provides juice to a battery setup that is able to last just slightly upwards of seven to eight hours doing things like word processing, video playback, and browsing the internet. The Surface Go charges using a proprietary magnetic snap-on connector. If you don’t want to carry around the charger though, there’s always the very handy option to charge up the Surface Go via its solitary USB-C port—just like you would do with an Android smartphone. 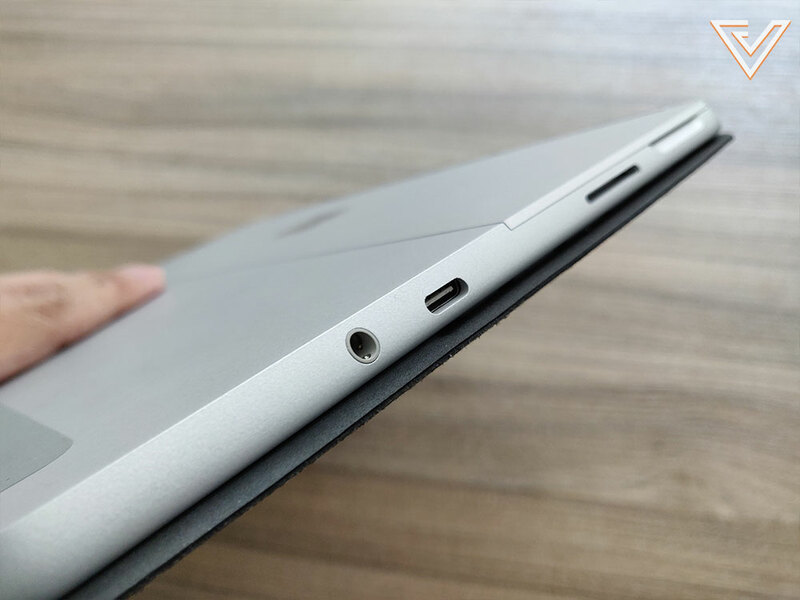 There is a solitary USB-C port for connecting external peripherals. Speaking of the single USB-C port, I must also mention that it’s the only way to connect any external peripherals, so if you need to plug in a USB stick, you’ll either need to be sure it’s in USB-C format (which still isn’t very widespread), or you could purchase an external adapter for regular USB type A formats. I guess for those that need to physically transfer data very often, just take note that this could be a bit of an issue. To provide a little insight, the Surface Go launched targeting those seeking a productivity device with the footprint of a tablet but all the trimmings of a proper PC. Instead of running on mobile-centric systems like Android and iOS, this one comes with a proper albeit limited version of Windows called Windows S that only permits apps and programs recognised by Microsoft on their app store. In Windows S, you are only able to use Microsoft Edge as your browser, use Microsoft Office as your productivity suite, and you aren’t allowed to install applications from elsewhere unless you permanently opt to switch from Windows S to a full version of Windows. As this was a test unit, I decided to just stick to Windows S and work with whatever options I had there. Putting the Surface Go through its paces, I half expected a subpar experience simply due to it running on Windows S instead of full-blown Windows, and also due to its lack of internal power—it runs on Pentium Gold instead of a regular i3 or i5 chip, meaning that you won’t expect to be doing video editing or heavy gaming on it. But just a few hours into using the device for work purposes, I was pleasantly surprised at how much I appreciated the mobility afforded to me due to its lightweight dimensions and the portability provided by the kickstand. It’s important to note here that I also worked using the type-cover keyboard that Microsoft provided. 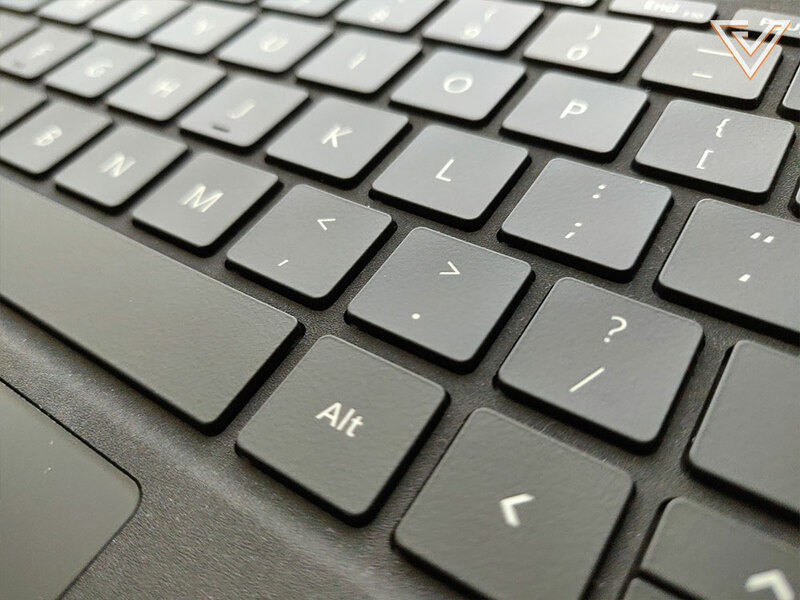 This keyboard cover doesn’t come cheap (RM399/SGD188), but lends a huge amount to the overall experience of working with the Surface Go. Just like the main device itself, the type cover keyboard is built extremely well and provides a nice typing and navigation experience despite the keys having virtually no travel distance. While this accessory isn’t particularly new or unique to the Surface Go (plenty of other tablets out there employ the same thing), it just makes everything fall into place as far as working on the go is concerned. Although you can work on the touch display by itself, I fully recommend getting the type cover in order to enjoy the full benefits of the Surface Go as a laptop. 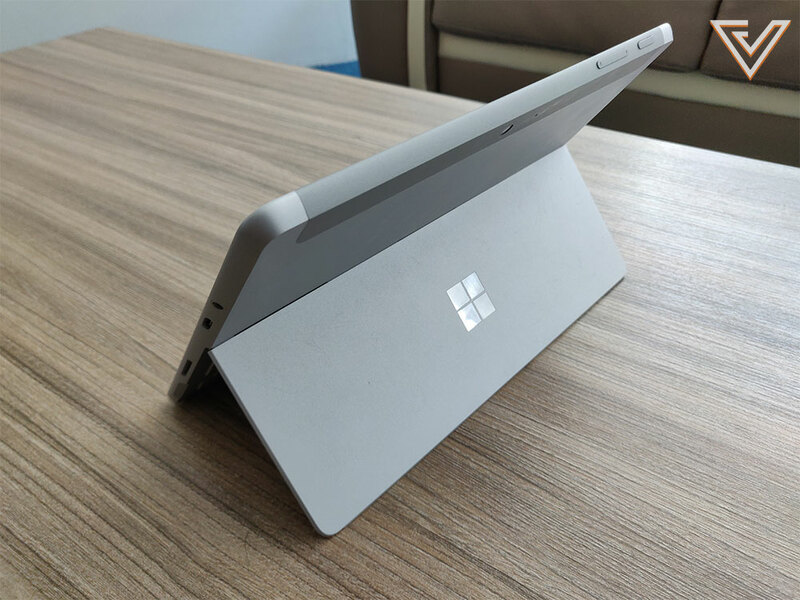 The type cover accessory ups the experience of using the Surface Go a great deal, making it almost essential that you buy one along with it. The type cover also connects magnetically via this port at the bottom. There was also an accompanying Surface Pen that came along with my review unit. While I didn’t spend too much time with it, I felt that it too was equally well-made. Connecting with the Surface Go via Bluetooth and powered by a changeable AAAA battery, the Surface Pen worked quite nicely with the PixelSense display and quite accurately tracked movements. For creative types, this will be an especially attractive draw if you plan to use the Surface Go with Photoshop or similar applications, which you can do once you permanently switch to the full version of Windows 10. Speaking of doing things other than work, I also found the Surface Go to be a very good media consumption device. The 10-inch screen was impressive in brightness and colour reproduction, and watching Netflix or YouTube was even better than what I was used to on my own personal laptop, sadly enough for me. In terms of speed and power, the Surface Go actually exceeded my expectations. Even despite only running on a Pentium Gold chipset, the performance offered was relatively quick when it came to the everyday stuff. Web-browsing, watching videos, working on Microsoft Word all went smoothly just as you’d expect, and even though I was unable to try it myself (due to being limited by Windows S), I’ve seen videos of people playing games such as Overwatch and CS:GO with minimal settings. In the end, I sought to answer the big question I had before I started reviewing the Surface Go—just how good could living with such a small device actually be? As it turns out, very good. Coming from usually working on a proper PC most of the time, I expected a subpar experience going onto a smaller and less-powerful machine. But spending over a week and a half with the Surface Go proved to me that smaller doesn’t always equate to less. In this case, the benefit I got from using the Surface Go was how versatile it was when it came to productivity options. Having the ability to carry around all of my work without the usual heft was a liberating experience of sorts, and I was left feeling a bit handicapped when I finally switched back over to using my full-sized laptop. Sure, returning to my usual work platform also meant going back to various comforts such as a bigger screen, more power for things like gaming and photo editing, but I eventually came to fully appreciate the benefit of working on a smaller footprint. 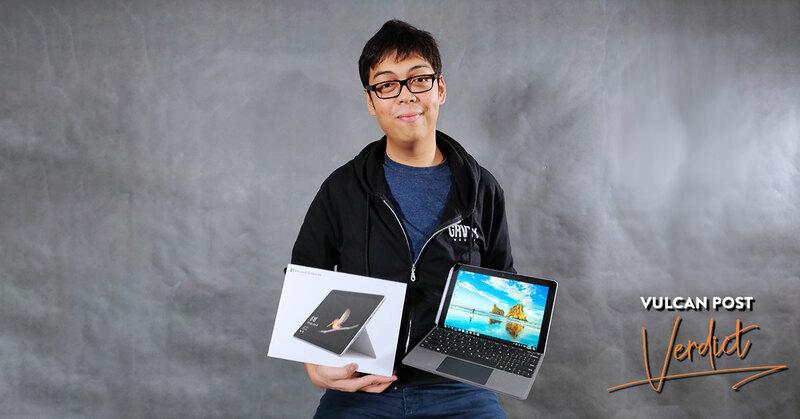 Ultimately, I see the Surface Go as a very viable option for university students and professionals in fast-moving environments, especially those looking to supplement their existing work set-ups, be it a proper desktop or even a laptop. The only caveat here is the slight premium you’ll have to fork out, with prices starting at RM1,955/SGD618 for the base model. You can find out more about the Surface Go here.